Several years ago, my uncle came up from Colorado for vacation, and while here, decided that he wanted to go charter fishing on a local lake and take some of us with him. So a few of my family members and I said, “Sure, we’d love to have you take us charter fishing!” Who wouldn’t want that? So we showed up at the Marina early one Saturday morning, and learned that we were going to go Fishin’ with Shorty. That was the name of the charter company my uncle had hired. And although the company had several boats with several different captains, we were lucky enough to get Shorty himself. He told us that he was the most reliable charter fishing company on the Lake. He boasted that he had never been skunked on any charter fishing trip, and that he had a policy that if he ever was skunked (if nobody on his boat caught a fish), he would refund all their money. Well, we did catch fish that day. In fact, everybody on board caught at least one fish. Shorty knew where the fish were. He knew what lures to use. He knew how deep to drop the lines. And so all of us caught fish. It was a good day of fishing. Later that day, when we docked back at the Marina, they took all the fish we had caught and filleted them for us. We ended up with over 10 pounds of good lake trout fillets. I remember thinking, “Wow. That was a lot of fun! How come I’ve never done that before?” But as we waited for the fish to be filleted, I found out why I had never gone charter fishing before. My uncle wrote out a check to Shorty for taking us charter fishing, and the bill came to several hundred dollars. I looked at our small pile of fish fillets, and figured that my uncle had just paid about $30 a pound for lake trout fillets. That’s why I don’t go charter fishing. It was a lot of fun, and we did catch fish, but it was expensive! Now, I guarantee you, there are many people in the world who would say, “Sounds good, who do I make the check out to, and when do we leave?” I mean, think of the fame you would get for being the person who caught the mythical Lake Monster? Or imagine if someone offered you the same deal for catching the Loch Ness Monster? Or for capturing Big Foot? Such an accomplishment would gain you worldwide fame and popularity. They would make movies about you. You would be interviewed by all the Late Night talk shows. Your face would be on all the major news networks. Well, as we continue to study the life of Christ in Luke, this is almost exactly what we see happen to a couple of fellows at the Sea of Galilee. They are fishermen, and they get their greatest haul of fish ever, and then Jesus comes along and says, “You think that was great? I’ve got something even greater for you to fish for. Only, it will cost you everything.” The stage is set in Luke 5:1. Before we look there, let me remind you what we have learned so far in Luke. We have seen the birth of Jesus Christ, and we learned a little bit about his growing up years. We also learned that Luke pretty much skips the entire first year of Christ’s three year ministry. This is because of the way Christ ordered his three years of ministry, and because of Luke’s purpose in writing. Christ spent his first year of ministry going around and getting as many people to believe in him as possible. Then, near the beginning of his second year of ministry, he picked a few of the believers in order to teach and train them to become his apostles. So Christ’s first year of ministry was all about gaining believers. Christ’s second and third years of ministry were all about turning some of those believers into committed and faithful disciples. Which explains why Luke tells us almost nothing of Christ’s first year of ministry. Luke wrote his Gospel to help believers, to help those who were already Christians, to become committed and faithful followers of Jesus Christ. Luke is not an evangelistic book. It is a discipleship book. The Gospel of John is an evangelistic book, which is why John does tell us a lot about what happened in Christ’s first year of ministry, and why John tells us almost 100 times in his gospel that God gives eternal life to anyone who simply believes in Jesus Christ for it. But Luke was written to Christians to tell them how to become disciples or followers of Jesus Christ. This is what we see in Luke 5. Jesus calls some of the men who have believed in Him during the previous year to follow Him, to become His disciples. And in this passage, we will see five characteristics of a disciple, of a follower of Jesus Christ. The first is that all disciples of Jesus Christ love to hear the Word of God taught. We see this in Luke 5:1-3. We remember from the end of Luke 4 that Jesus was going all over the region of Galilee preaching and teaching in the synagogues. And if you remember, we learned that His normal style and practice of teaching was to teach through books of Bible line by line. This has always been the way God intended His Word to be taught. But Jesus didn’t just teach this way in the synagogues. Luke 5:1 says that He was teaching the word of God as He stood by the Lake of Gennesaret. The Lake of Gennesaret is another name of the Sea of Galilee. And the people pressed about Him to hear the Bible taught and explained. This is a clear, identifying characteristic of a true disciple of Jesus Christ. They love to hear the Word of God taught. They long to hear the Bible explained to them. You see, the word “disciple” means “pupil” or “student.” And all disciples of Jesus Christ know that their main text book, their only source of information about God and Jesus Christ, and the Holy Spirit, about salvation, about heaven, about all things relating to spirituality is the Word of God. And people who truly love God, want to know as much about God as possible, and the only way to do this is to study God’s Word and hear God’s word taught. Luke 5:2. and saw two boats standing by the lake; but the fishermen had gone from them and were washing their nets. The fishermen had spent all night fishing, and now had beached their boats, and were off to the side cleaning their nets. Most likely, they were able to listen to Jesus teach while they went about their work. When Wendy and I went down to Mexico about four years ago, we were able to witness first hand the same fishing practices that we read about here. We went to Kino, Mexico where the main source of income was fishing. It was fascinating to watch them clean and mend their nets and realize that this is the same thing we read about here in Luke 5. Jesus sees the two empty boats, and the fishermen cleaning their nets, and the crowd pressing close and closer, so He decides to teach them from one of the boats. Luke 5:3. Then He got into one of the boats, which was Simon’s, and asked him to put out a little from the land. And He sat down and taught the multitudes from the boat. Now this is the not the first time Jesus and Simon had met. Near the very beginning of Christ’s ministry, Jesus had been walking along the shore, and had seen Peter and Andrew fishing, and had called them to come follow Him. 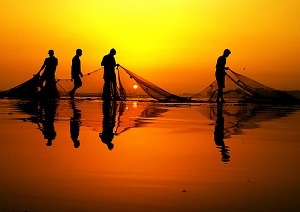 Walking a little further, Jesus had seen James and John mending their nets and had also called them to come follow Him. All four did come follow Him, and for a whole year, they witnessed His miracles, and listened to His teachings. They heard him teach over and over that God gives eternal life to anyone who believes in Jesus Christ alone for it. Most likely, it is during this year that Peter, Andrew, James and John all believed in Jesus for eternal life. But now, they have gone back to fishing. And one day, as they are out fishing, Jesus shows up again, and begins to preach. They enjoy listening to Him teach about the Bible – it gives them something to listen to while they clean their nets. But they don’t stop what they are doing. After all, listening to sermons never put any food on the table. And some of them, like Simon for example, had a wife at home who he needs to provide for. They had followed him for a year, but now they needed to get back to making a living. But they were having a hard time of it. It had been a difficult night of fishing. They had fished all night, but hadn’t caught a single fish. So now they were cleaning their nets so that they would be well prepared for later tonight when they might have more luck. As they clean their nets, Jesus continues to teach, and the crowd begins to press in on him more and more, until finally, Jesus gets into Simon’s boat and asked Simon to take them a little way out so that Jesus can teach from there. Simon had just finished cleaning his nets, and was kind of hoping to get some sleep because he had to go fishing again later, and now Jesus wants to borrow his boat. But the sermon was good, and this would allow Simon to hear it better, if he was in the same boat with Jesus, and so he picked up his nets, put them in the boat, and then shoved off and rowed a little way out from shore so that Jesus could continue to teach. Now, I don’t know if this was actually what Simon was thinking. You all understand I’m taking a little creative liberty with the text. But here is what I do know. There have been many, many times in my own life when I did not want to go to church, or I did not want to go to Bible study, or I did not want to do my devotions. I was too sick, or too busy, or too tired, or had other things that seemed like they would be more fun. And some of those times, I chose to do the other thing rather than attend church or do my devotions. And it was fun. It was relaxing. I did get sleep. But, some of those times, I chose to go to church, or go to the Bible study, or do my devotions even though I didn’t want to, and do you know what happened? Without fail, it always happens that those are the times that God uses His Word most powerfully in my life. Those are the times that God’s Word seems to just jump out at me. Those are the times that it seems that the voice of the preacher is the voice of God Himself speaking right into my soul. Those are the times I get shivers from the sermon. And I believe that in those times that I chose to sleep, or chose to go fishing rather than get into God’s Word, I believe I missed out on something that God had especially for me. I have found that when I am tired and I don’t feel like going to church, that is because God has something for me at church, and Satan doesn’t want me to hear it. I have found that when I am most busy, and I don’t think I can fit my devotions into my schedule, that is because God has something special for me in my Bible reading that day, and Satan doesn’t want me to receive it. Some Sundays do you feel like you just don’t want to go to church? Those are the Sunday’s you really need to come, because God has something for you that you don’t want to miss. So come, look for it. Pray that God will speak to you, and He will give you something that will make you so glad you came. It’s the same with your devotions or Bible study or any other spiritual exercise. I am certain that after a long night of fishing without catching any fish, and then after a long morning of cleaning nets, Simon didn’t feel like listening to a sermon. But I am certain that after listening to Jesus preach, he was glad he did. Simon revealed the first characteristic of being a disciple of Jesus. Disciples love and long to hear the Word of God. They can’t get enough of it. If it were possible, they want it morning, noon, and night. They want it so bad, they press in on Jesus so that He has to get into a boat just so he can continue to teach. They want it more than sleep, more than rest, more than food. Simon certainly needed all these things, be as a true disciple, he chose to listen to the teaching of the Word of God instead. And because of Simon’s decision to forsake himself and listen to Jesus, Jesus is now going to bless Simon with first a physical blessing, but then an even greater spiritual blessing. When we obey Jesus, blessings always follow. But sometimes, obedience isn’t easy. Sometimes, Jesus asks us to do some pretty strange things. But this is the second characteristic of a disciple. They obey Jesus even when it doesn’t make sense. Pause and try to understand what Jesus was asking Simon to do here. First of all, Simon was the fisherman, Jesus was a carpenter and a teacher. Who knows more about fishing? Peter should be instructing Jesus about how to fish, not the other way around. Second, Simon had already been fishing all night long, and he hadn’t caught a thing. And besides that, this was probably near the middle of the day now, and everybody knows that the middle of the day is generally the worst time to fish. The fish have retreated to hide under their rocks and submerged logs. They have gone to the cooler parts of the water. As long as the sun is out, they hide where no predators can see them. So chances are, if they didn’t catch anything at night, they surely wouldn’t catch anything during the day. And finally, most frustrating of all for Simon, is that he had just finished cleaning his nets to get them ready for fishing later when the fishing would hopefully be better. If he dropped them in the lake now, he would have to clean them again later. This request of Jesus to put down the nets doesn’t make any sense at all, and will only cause more work for Simon. Yet look what Simon says in Luke 5:5. Wow! There is a statement of faith! Simon tells Jesus that this request doesn’t make much sense, but he will obey Jesus anyway. He says, nevertheless at Your word I will let down the net. Sometimes, the things God wants us to do doesn’t make much sense to other people, or even to ourselves. But if God has spoken to us through His Word, we must obey. This is what Simon did. Luke 5:6-7. And when they had done this, they caught a great number of fish, and their net was breaking. So they signaled to their partners in the other boat to come and help them. And they came and filled both the boats, so that they began to sink. Obedience to Christ’s commands always results in divine blessing. Here the blessing was a boatload of fish. So many, in fact, that their nets were about to break, and they had to call their friends over to help them. But even then, the two boats were not large enough to hold all the fish. They filled both the boats to overflowing, and then the boats began to sink! When God tells you to do something, do it, even if it doesn’t make sense. God told Noah to build an ark because a flood was coming when nobody had ever even heard of rain. And Noah did it. God called Abraham to pack up his possessions and start walking. And Abraham did it, even thought he didn’t know where he was going. God told the people of Israel to march around Jericho for seven days if they wanted the walls to fall down, and they did it. God wants to work through you. God wants to bless you. But you have to be like Simon who says, “That doesn’t make sense, but nevertheless, at your word, I will obey.” Disciples obey Jesus even when it doesn’t make sense. The third characteristic of disciples is found in Luke 5:8-10, and there we learn that disciples are aware of their own sinfulness. Luke 5:8-10a. When Simon Peter saw it, he fell down at Jesus’ knees, saying, “Depart from me, for I am a sinful man, O Lord!” For he and all who were with him were astonished at the catch of fish which they had taken; and so also were James and John, the sons of Zebedee, who were partners with Simon. Simon Peter’s response initially surprises us. Is this the way you would respond to a miracle? Why is it that this event caused Simon Peter to realize his own sinfulness? Put yourself in his shoes. How would you respond if you just caught a record breaking number of fish? You would shout and yell, and celebrate. But Peter does exactly the opposite. He fell down and tells Jesus to leave him because of how sinful he is. Why does he do this? For the answer, remember what has happened to Simon Peter and the recent decisions he has made. A year prior to this event, Jesus had called Simon to follow him and be his disciple. At that time, Peter had accepted the call. He committed himself to following Jesus. But in that year, he probably didn’t make a whole lot of money. Oh sure, Jesus made certain that Simon’s needs were met, but there was rarely abundance. So now, Peter had gone back to fishing. A man’s gotta work, you know. He has to provide for his family. He has to put food on the table. So Simon stops following Jesus, and goes back to fishing. But he has trouble with it. He doesn’t enjoy it like he used to. A lot of times, he doesn’t even catch any fish. One of these times, Jesus shows up on the shore in the morning and starts teaching. Afterwards, Jesus takes Simon out fishing, and they catch a record number of fish. And Simon realizes then that God will supply all of his needs. If he follows Jesus, he will not go without food or clothes. Simon Peter realizes his own proud and arrogant self-sufficiency. Jesus had asked Simon to follow Him, and Simon, after following Jesus for a while, had gone back to fishing. This implied that he had more important, more practical things to do. In Luke 5:8, Simon Peter recognizes his grave mistake. There is nothing more important than following Jesus. And when we follow Jesus, He promises to provide for our needs. Making something or someone else in our lives more important than following Jesus is sin. That is what Simon Peter realizes here. He put fishing and providing for his family above following Jesus. Fishing is enjoyable. I love to fish. Providing for your family is important – vitally important. But both must come after the supreme priority of becoming a disciple of Jesus. Nothing is more important than this. But not only is nothing more important than following Jesus – nothing is more rewarding either. Simon was chasing after a few fish. He got a boatload of fish, but even still, it’s only a boatload of fish. Some of us chase after a bigger paycheck, a nice house, a newer car. We may get it, but these are only a paycheck, a house, a car. They are not nearly as valuable as what Jesus offers to Simon next. It’s kind of like that story I started out with – the man on the shore who invites you to go fishing for the mythical Lake monster. That is what Jesus is doing. He gave them the best day of fishing ever, then told them that if they were up to it, He has even better things in store for them than that. And you know, the Bible tells us this same thing all over. Proverbs 11:30 says that he who wins souls in wise. The value of single human is greater than a boatload of fish. If the disciples catch one single person out of the clutches of the devil and help bring that person into the loving arms of God the Father, that catch alone is of infinite and eternal value. When all the fish in the world have died, or been eaten up, that human being will live on and on and on in eternity. Jesus is inviting the disciples to make a catch that will last for eternity. He has given them a choice. They can continue to be fishermen, going out every day trying to catch a few morsels of meat, or they can fishers of men, going out every day trying to catch human lives that last for eternity. How do you become a fisher of men? By following Jesus. Nobody becomes a fisher of men naturally. Nobody becomes a fisher of men by being told a thousand times, “You better go witness, because that’s what Christians do.” Nobody becomes a fisher of men by being put on a guilt trip that they aren’t out there doing door-to-door evangelism. You become a fisher of men by following Jesus. If you decide to follow Jesus down the path of discipleship, He will make you fishers of men. And that is why this is the fourth mark of a true disciples. They become fishers of men. So we’ve seen that true disciples love to hear God’s Word taught, they obey Jesus even when it doesn’t make sense, they are aware of their own sinfulness, and they become fishers of men. Let’s see the final characteristic found in Luke 5:11. They are willing to forsake all and follow Christ. Luke 5:11. So when they had brought their boats to land, they forsook all and followed Him. Simon just had the greatest fishing day of his life. He had the greatest fishing day he had ever heard of anybody ever having. He had probably caught more fish in one day than he had ever caught before in an entire year. Enough to fill two boats. Hey, they could sell the fish, and not work for a whole year! That would be great. Think of the family vacations they could go on. Think of the nice clothes he could buy for his wife. Think of the new house they could afford. But Jesus has just called them to go after something bigger and more valuable. 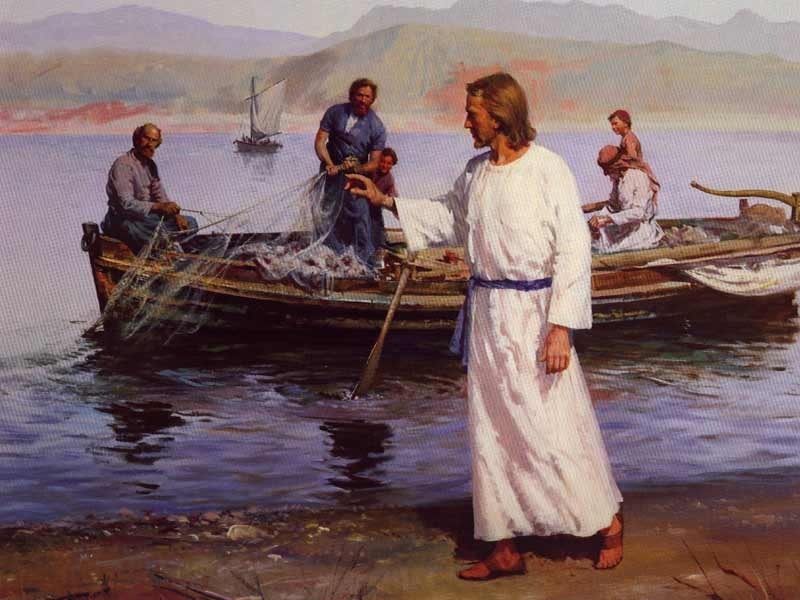 He had called them to be fishers of men. And they realized that this was of such supreme importance, that they forsook all and followed Him. They didn’t even pause to count the fish. They just beached the boats, then jumped to land, and left it all behind. The boats, the nets, the record number of fish, everything. They knew that following Jesus was much more valuable than a boatload of fish. 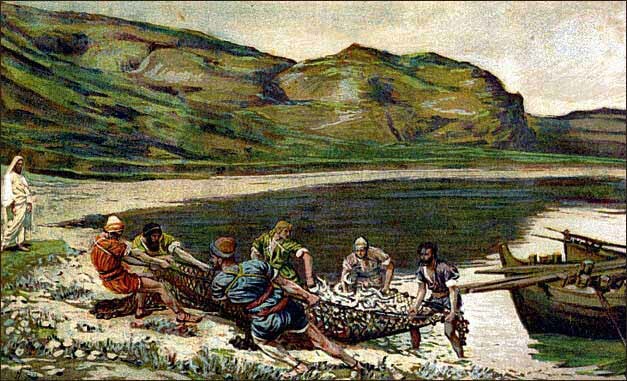 And they knew that if Jesus could give them a boatload of fish in the middle of the day, He would certainly provide for their needs later as they arose. So they didn’t care about what they were leaving behind. It didn’t matter when compared to the value of following Jesus. Becoming a Christian is absolutely free. There is no cost whatsoever. Jesus paid it all. Through his death, he paid the penalty for our sin. We receive the free gift of eternal life simply by believing in Jesus Christ for it. But becoming a disciple is completely different. There is great cost involved to becoming a disciple. It may cost everything you have, everything you are, everything you own. But the results are well worth it. The reward far outweighs the cost. This is what Simon and his companions realized, and this is why they left everything and followed Christ. They were already believers. They had already believed in Jesus for eternal life and so were guaranteed a place in heaven. But now Jesus was calling them to much more. Jesus was calling them to become a disciple, and they answered the call with a resounding YES! Are you willing to give up your schedule and your priorities, and make listening to God’s Word a priority? Are you willing to give up what you think you know about life and success and just obey Jesus no matter what? Are you willing to give up your priorities and make following Jesus your top priority? Are you willing to give up your plans for you life and let God use you to bring people into His kingdom? Are you willing to give up all your possession and worldly wealth and forsake it all for the sake of following Jesus? Simon Peter did, and it not only changed his life, it changed eternity. “Try throwing your nets on the other side of the boat” the man hollers back. Simon Peter rolls his eyes. Who does this guy think he is? Jesus? But he glances at his fishing buddies in the boat with him, and they all shrug. Why not? What could it hurt? So they do it. They haul in their nets, and toss them off the other side of the boat. And just as before, they caught so many fish, they couldn’t bring them all into the boat! Simon Peter knew it was the Lord, and so he jumped into the water and swam to Jesus. Let his friends deal with the fish – he just wanted to be with Jesus. Who cares how silly he looked splashing around in the water, he just wanted to be with Jesus. I have been blessed. It is a good sermon. Some helpful things in here but some things I have no idea how they can be said. How do you know that “His normal style and practice of teaching was to teach through books of Bible line by line”. And to say that “This has always been the way God intended His Word to be taught” seems highly presumptuous. It certainly can be a good way to teach the Bible, but where is the authority to say such a definite statement about God’s intentions? Also, the Bible says, in Luke 5:1 that “the people” were “listening to the word of God”. How can that be interpreted as “they hung on His every word. They wanted to make sure they understood”? It just seems there is a certain amount of reading things into the text that cannot be inferred by the straightforward reading of the text. Such a practice then makes me not want to read further as I’m not sure I can trust what is being said about the meaning of the Bible and its message as the Word of God. Clearly someone is take God’s Word seriously here, and so thank you for that, too.